Leifheit's Stainless Steel Jar Opener is an impressive kitchen utensil. It is perfect for opening all common jars, bottles, and tubes. It works because of its sturdy design and long handle that give you more leverage, increasing your strength and popping opens jars. 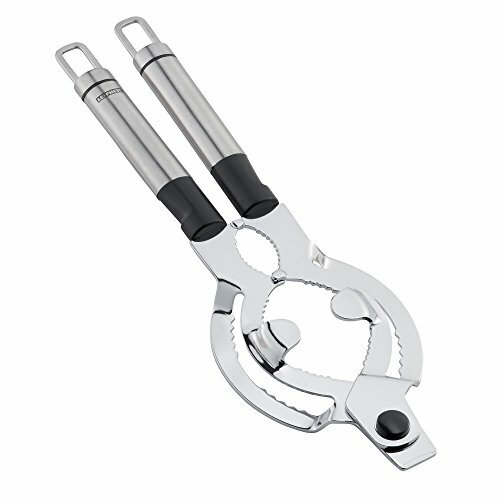 The mouth of the opener is studded with steel teeth to grip jar lids securely. The hinged tool opens to fit almost any size jar. It's an impressive looking gadget--intimidating to look at, easy to use! Conquer every jar in your kitchen or bath with this handy gadget that really works.